Fall – the season when nature erupts in a burst of colors – fiery reds, burnt orange, muted yellow…. Trees shower down their leaves in these hues and the ground looks like a magical carpet. 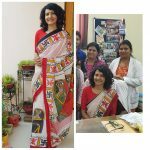 Meet #48, my Fall Saree. 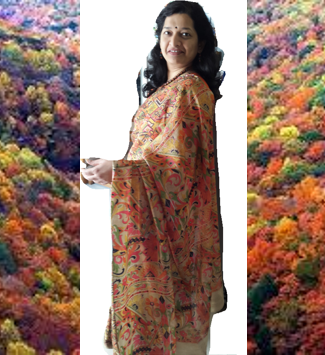 A printed silk in hues of all the Fall colors. One of my favourites, a saree that feels as beautiful as it looks. I’ve had this for many years now, and every time I drape it I am reminded of happy memories of the Fall colors in Smoky Mountains. (No, I didn’t drape it then, but somehow my mind always makes that association). P.S. – the picture today has a bit of crop, cut & paste, as I tried to bring the fall colors into the frame, unfortunately with very limited success. But anyway, bit of a crazy mood today, so this is how it goes! !